The Manchester by the Sea star hosted Saturday Night Live's star-studded final show of the year. By Matt Juul·	 12/18/2016, 1:27 a.m.
Casey Affleck unleashed his inner, angry Bostonian while hosting Saturday Night Live for the first time over the weekend. The Manchester by the Sea star got the chance to close out 2016 by showing off his comedy chops on SNL‘s star-studded final episode of the year. 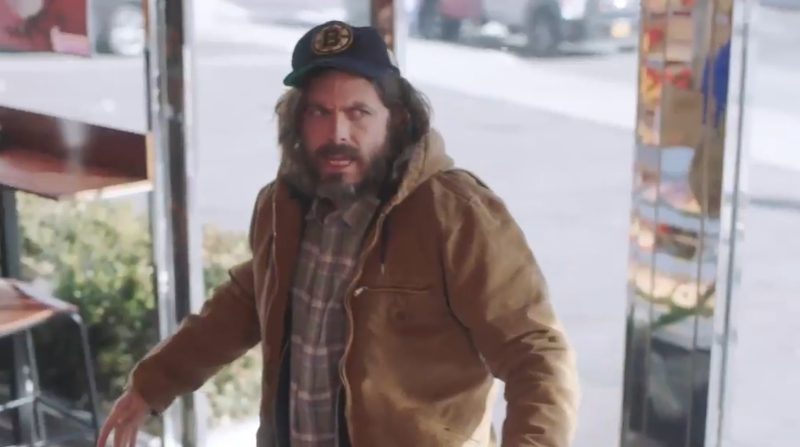 As an homage to his hometown’s favorite coffee chain, one of the night’s sketches features Affleck as a hot-headed Boston sports fan and Dunkin’ Donuts customer who’s constantly picking fights while filming an interview for a commercial. Alec Baldwin once again reprised his role as Donald Trump in the show’s cold open, which poked fun at the President-elect’s relationship with Russian President Vladimir Putin. Patriots Day actor John Goodman stopped by SNL as well to play Trump’s pick for Secretary of State, ExxonMobil CEO Rex Tillerson. Following the opening sketch, Baldwin and Goodman gave Affleck a hand during his monologue, where the actor pondered over why he was chosen to host the last episode of the year. Ladies and gentlemen, Casey Affleck! The show also featured Chance the Rapper as the night’s musical performer. Fred Armisen and Darryl McDaniels of Run–D.M.C. made guest appearances as well.